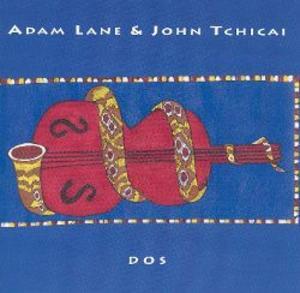 Adam Lane and John Tchicai contrast in several ways: age, style, and geographical location, to name a few. The thoroughly virtuosic Californian bassist Lane performs with a maturity that belies his youth, while the focused Danish tenor saxophonist Tchicai brings decades of experience to the table. Despite their differences, they are not newcomers to one another, having recorded together on several occasions with larger groups. Where they connect on these attractive pieces for duo is in their relatively spare placement of notes that eschews technical bravado but instead passionately, yet circumspectly, embraces a suave reticence embedded deeply in the past but that is coyly immersed in the here and now. Tchicai is at heart an individualist who pursues his own paths. Rejecting the free and energetic explosions that have hooked many of his contemporaries, the saxophonist relies on a gentler approach that uses repetition and motivic structure to assure an evolutionary drive toward melodic and rhythmic development. Almost all the pieces were written by Lane, whose bass sometimes gets buried in the mix, but his wonderful, exalting runs underlie the heart of the saxophonist's emphasis on pure sound. Sometimes, as on "Even the Stars Were Sad," the duo is melancholic, so much so that the listener gets sucked into the lair. Yet the overriding mood on the album is not sadness but a peaceful fulfillment that marks an almost Eastern egoless contentment. ~ Steven Loewy Liner Note Authors: Marc Rusch; Robert D. Rusch; Adam Lane. Recording information: The Spirit Room, Rossie, NY (10/02/2002/10/03/2002).